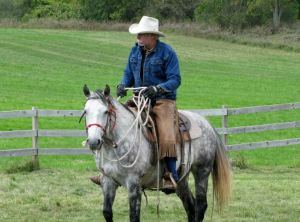 I am currently in the market for a new horse and have embarked on my journey in search of the perfect equine partner. I’m looking for ‘horse nirvana’…the perfect partner to help me continue my horsemanship journey. It’s not an easy task, and it’s certainly one that requires more patience than I was born with. Like many of you, finding a new horse is process I don’t take lightly and I have repeatedly been reminded that it’s a process that can not and should not be rushed. Before I reviewed my first ad or video, I pulled out my well-worn copy of Smokie Brannaman’s insightful book, “Whisper This…..”, one of the most insightful, common-sense based and humorous books I’ve ever read. This particular book helps me focus on what’s important in everything from deciding what to look for in a horse, all the way to improving my relationship with my horse and fine-tuning my horsemanship skills. It also makes me giggle…a lot. I have a great admiration and respect for true, authentic horsemen and women who can truly articulate their thoughts, experience and insights on ways I can improve my relationship with my horse. If they can convey all of that with a sense of humor, I’m IN. Smokie’s first chapter is devoted to the age-old question we all need to ask ourselves: “Why do I want a horse?” and it continues with “What do I want and need to look for in a horse?”. Those might sound like a simple questions but the truth is many people skip over this all-important question and quickly end up in a not-so-great equine partnership. I want the BEST possible equine partnership, so I sat down and actually wrote down what I am looking for this time. I’m older, wiser (my children might argue this point, but it’s my story so I’ll tell it from my perspective) and helped me realize how much my needs have changed over the years. The advice and insights in “Whisper This….” helped me focus on what I am really, really looking for and need, this time around. For more information and/or to order (trust me it’s worth the very affordable $12.95 investment), visit Smokie’s website. This is one of several books from Smokie that I strongly encourage you to read & enjoy!